If I sign up for a discussion group, how will I be able to view the messages? They will automatically be sent to your email address. You can also choose to view the messages in a variety of ways (online only, summary, etc) by logging in, and selecting subscriber options (see image below). For an explanation of receiving modes, you may click on the help button for more information. I tried to sign up, but I have not gotten any messages. Please double check your email address and be sure you entered it correctly when you signed up. If your email address has changed, you must update your email information with Account Services. If you still don’t receive any messages, please email webmaster@answers4families.org or call 800-746-8420. How do I send messages to the discussion group? 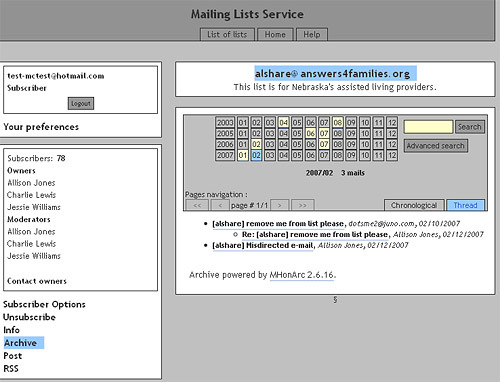 There are two ways to send messages to the e-mail discussion groups: 1) 'Post' it on the web, using the Answers4Families Discussion Group section; 2) Send it through an e-mail program or your Internet browser. How can I view past discussion? Once you have logged into the discussion groups, select your desired discussion group. To view past discussions, select the ‘Archive’ link (on the left-hand side of screen). From here, you can select from a calendar, the month and year of archives you wish to view. Who will see the messages I send? Only persons signed up for that discussion group will receive the messages. Also, to view the past messages in the archives, a person must be signed up for that discussion group. Will I get ‘junk mail’ if I sign up for a Discussion Group? No. We do not share your email information with anyone. We do not allow companies to advertise on our site either. We will not contact you personally unless there is a situation that we fell requires this. For instance, we may contact you if we have reason to believe your computer may have a virus because of an attachment you sent to the discussion group. If you have further questions, please email webmaster@answers4families.org or call 800-746-8420.